Home » Why, Japan, Why? » Why Do Only Men Get Chocolate On Valentine’s Day? Why Do Only Men Get Chocolate On Valentine’s Day? 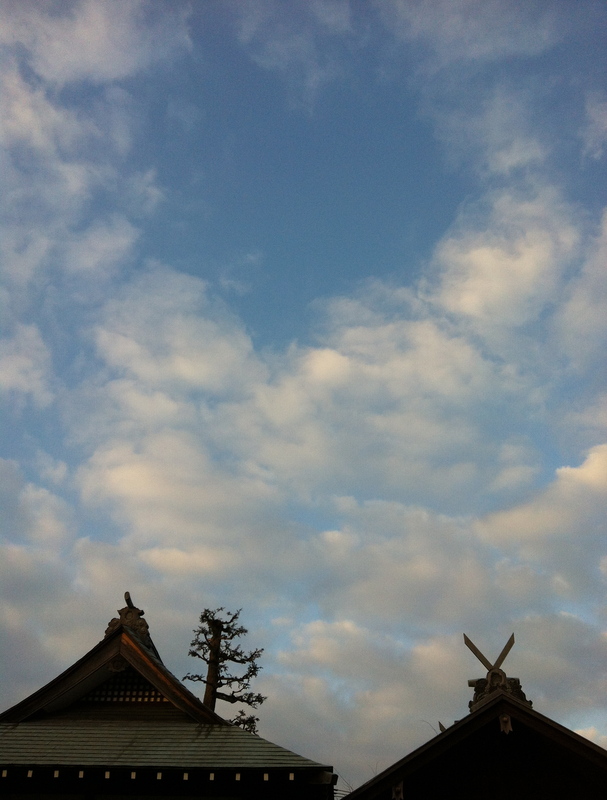 This picture actually has nothing to do with the strange interpretation of Valentine’s Day in Japan, but doesn’t it look like there’s a big blue heart in the sky over the shrine next to my apartment? So, you know how in Japan, women don’t get any chocolate or roses or 600 carat diamond necklaces on Valentines Day? On the contrary, they’re supposed to fork over chocolate to men, even male co-workers who might erroneously take it as a sign that the woman wishes to receive the gift of sexual harassment in the near future? Well, I finally heard an explanation of how the whole thing went so wrong: it was actually meant to be the romantic version of Opposite Day – the one day a year on which women could give romantic gifts to men with a “Dude, HELLO, do I have to hit you over the head and drag you off to my cave by the hair?” message, or even <gasp!> propose marriage!